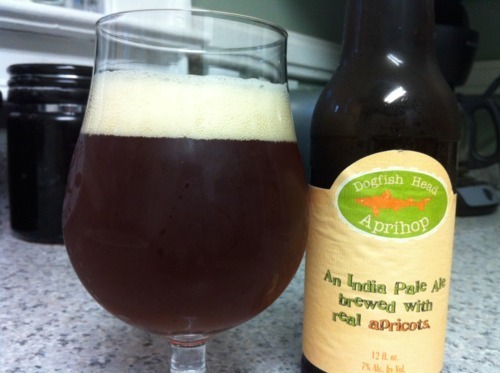 Dogfish Head Aprihop | Drink. Blog. Repeat. I’m a creature of habit when it comes to seasons. As soon as it starts to cool off, I can’t get enough stouts, porters and barleywines. But during the spring and summer – especially when the humidity reaches levels that make you feel like you’re swimming as soon as you step outside – I tend to lean toward the lighter fare. For me, that means mostly IPAs. Last spring was the first time I got to try Aprihop, Dogfish Head’s spring seasonal. At 7%, it may seem like a bit heavier IPA for springtime, but it’s perfect for porch weather. While it is brewed with apricots, giving it that nice tart sweetness, there’s a strong malt character that gives it kind of a chewiness, and it’s pretty aggressively hopped. DHF’s Sam Calagione described as “a fruit beer for people who hate fruit beers,” so it pleases both ends of the spectrum. Aprihop pours a really dark orange color, almost verging on a copper or brown. It’s crystal clear when you hold it up to the light, and there’s a good two fingers worth of a rocky head on top. A bit of lacing, but nothing drastic. The apricots are really pronounced on the nose. But again, there’s that malt character that gives it a bready quality. There are also the mango, pineapple and papaya notes you’d expect from an IPA. The hop character on the front is sweet and a bit biting. At first, the apricot flavor punches through, along with hints of orange, a bit of lemon and other citrus flavors. As that dissipates, the malt characters shine through, giving way to a really nice, chewy mouthfeel. There’s a slight hop and bitterness on the back of the tongue as well. This is easily one of my favorite spring beers. It’s extremely well balanced, super drinkable and has a lot of great flavors and characteristics. It’s sweet enough to please fruit beer fans, but hoppy and malty enough to make everyone else happy.